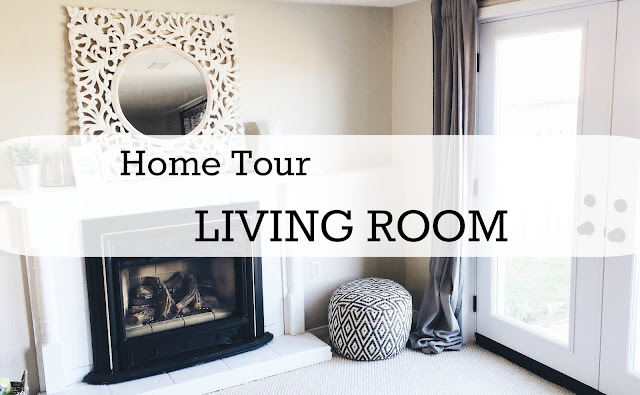 I'm so excited to share some updates we have done to our living room with you. I told you a little bit about our current home here, and shared that we were getting new doors. We went with French Style doors to replace the outdated sliding doors in our living room that lead to our backyard. I love that when we are entertaining, our guests can easily go in and out of the backyard. We haven't done much to this room, but the small changes that we did make have made a huge impact! We painted the outdated tile fire place white, which you can read all about here. We decided to go with Matte Black Georgian Knobs, black hinges and a black sill as well to add some contrast to the white door. There is an invisible screen that pulls out from each side of the door frame so we can keep the bugs out when both doors are open. I love how this room is coming together so far and we haven't even touched the floor or painted any walls. 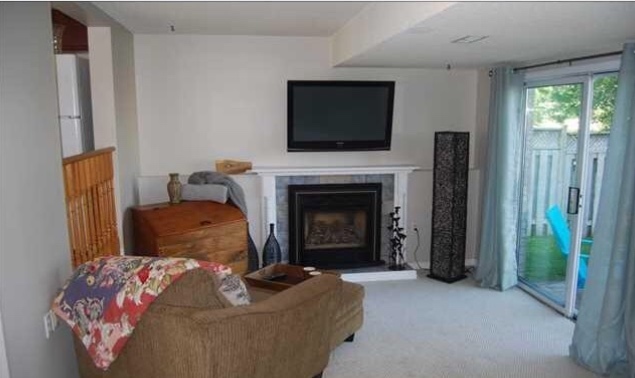 Here is the before photo from the original MLS listing and a photo of the room after we made some small changes. I have a few more projects in mind that I will be sharing with you in the next few months! Currently, I am in the process of painting those outdated orangey oak spindles.